Sorry for the long gap in between previews, I've had a lot going on and I finally was able to acquire some time to sit down to do another installment of the MLB preview series. Same goes for the podcast, we will be getting that started up again soon. Thank you for your patience and thank you to those who have read the first two installments of this six part series. Without any more waiting, here is the preview on the American League West. It was a busy and eventful offseason for the Los Angeles Angels. They made a lot of moves and signed lots of key players that they lacked last year which prevented them from making it to the post season. None were bigger then the free agent signings of Albert Pujols and C.J. Wilson. December 8th was an exceptional day for the Angels this offseason. They signed Albert Pujols to a 10 year, 254 million dollar deal. Later that day, they acquired C.J. Wilson from free agency for a 5 year, 77.5 million dollar deal. Earlier in the day they acquired free agent relief pitcher LaTroy Hawkins and signed him to a 1 year deal. 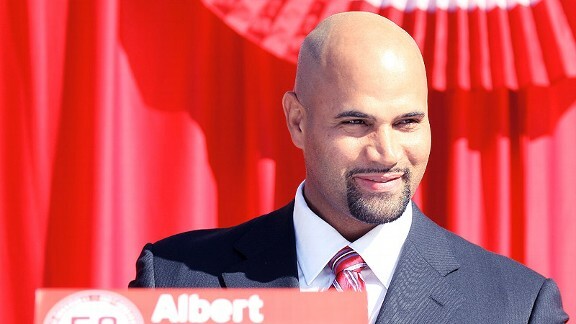 Albert Pujols addresses Angels fans in his introductory press conference. The Angels proved that there is a such thing when agents bounce around the term "mystery team" when talking about free agency, With those 3 major signings, it left the Angels in no position to acquire any other big names to big contracts, but they did however sign some very decent players to minor league deals. They signed infielder Jorge Cantu and relief pitcher Jason Isringhausen to minor league deals and will likely make the main roster. They also traded for catcher Chris Iannetta and lefty pitcher Brad Mills. Finally, they extended Howie Kendricks for 4 years and will be the Angels' second baseman until 2015. Final Thoughts: To stay above the Rangers this year, the Angels pitching staff has to do much better through the whole season and fall off at the end like in 2011. I'm not sure with their weak bullpen that they can stay afloat over the Rangers. Also, Albert Pujols cannot have a slow start as he did with the Cardinals last season. His transition will be the big deciding factor in the success of the Angels. The Texas Rangers have a lot to prove in 2012. They were mere outs away from capturing their first World Series championship in franchise history. However, they fell short of that task. The Rangers were one of the rumored teams to be contenders for Prince Fielder in the offseason. That was true up until they won a 51 million dollar bid on Japanese pitcher Yu Darvish. They would later sign Darvish to a 6 year, 60 million dollar contract. This turned out to be a great acquisition for Texas, as they lost C.J. Wilson to free agency to divisional rival L.A. Angels. The Rangers are hoping that Yu Darvish lives past the previous attempts of successful Japanese stars coming to the MLB. 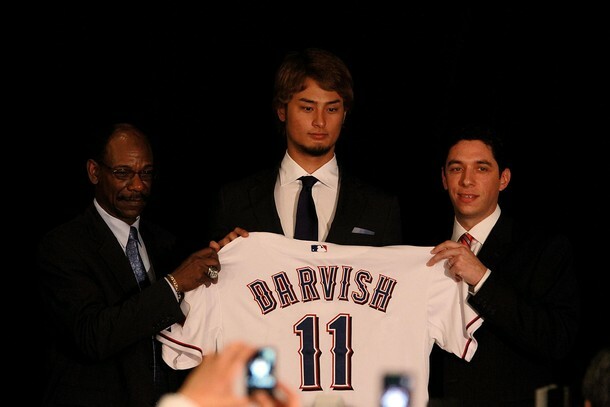 Ron Washington (left) and Jon Daniels (right) welcome Yu Darvish (center) to Texas with his jersey. Final Thoughts: Notice anything about that team? Minus Mitch Moreland, it's the same opening day roster as they had last year against the Red Sox. Offensively, this team is an absolute dream team power house. The battle between the Angels and Rangers for the AL West crown will be an absolute dog fight, and I can't wait to sit back and watch. 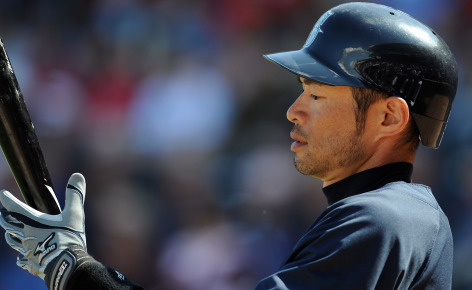 Ichiro will bat 3rd in lineup for Mariners in 2012. Final Thoughts: I don't think anyone expects the Mariners to compete at all this year in this division. I think it is in their best interest to work with their minor league players and prospects as much as possible to start the rebuilding process in Seattle. Ichiro is nearing the end of his career, which is sad because just 10 years ago he was reigning Rookie of the Year and American League MVP. There is a lot to say about the Oakland Athletics. There's the bad, there's the good. There's the "What the ^&*$% are you people thinking?" All in all, this has been a business as usual yet effective and improving offseason for the Athletics. They did trade away all of their good starting pitching yet again, resuming their role as MLB's farm system. They sent Trevor Cahill to the Diamondbacks in exchange for Collin Cowgill and two other players. They traded Andrew Bailey to the Red Sox for Josh Reddick in a five player deal. And, finally, they sent Gio Gonzalez to the Nationals for Brad Peacock and two others in a six player deal. They also lost Josh Willingham to the Twins and David DeJesus to the Cubs due to free agency. 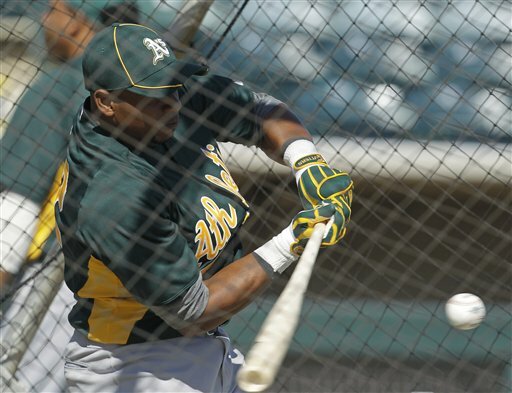 Yoenis takes batting practice for the first time with A's. Final Thoughts: I have no idea what Oakland has planned for third base. They just lost Scott a few weeks back so I'm sure they are still figuring it out. Also, first base is up in the air due to health issues but Brandon Allen is having a monster spring so far so if he continues to put up numbers he will start opening day. Offensively, this team looks okay on paper. Starting pitching, however, will haunt this team from April to August. Don't look for a Moneyball season out of this A's team. And with that, we are halfway done. Which means Opening day is that much closer. As a matter a fact, a month from today, March 6th. Next week, I will be jumping over to the National League and will be looking over the NL East division in the same structure as this blog. I hope everyone enjoys reading this. Please leave your thoughts on here or on the Twitter feed (@WISportsBlog) if you agree, disagree, or want to make a point. I look forward to reading your comments.